This collection of 21 articles is designed to serve as a state-of-the art reference book for intersexuals, their parents, health care professionals, ethics committee members, and anyone interested in problems associated with intersexuality. It fills an important need because of its uniqueness as an interdisciplinary effort, bringing together not just urologists and endocrinologists, but gynecologists, psychiatrists, psychologists, lawyers, theologians, gender theorists, medical historians, and philosophers. Most contributors are well-known experts on intersexuality in their respective fields. The book is also unique in that it is also an international effort, including authors from England, the Netherlands, Germany, Australia, India, Canada and the United States. 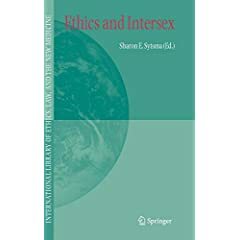 The book begins with introductory chapters on the etiology of intersex conditions, conceptual clarification, legal issues, and reflections about the inherent characteristics of medical care that have led up to the issues we face today and explain the resistance to change in traditional practices. Researchers provide recent data on gender identity, surgical outcomes, and appropriate clinical care. Issues never having been addressed are introduced. The significance of intersexuality for Christianity and for philosophical concerns with authenticity add further depth to the collection. The final chapters deal with future possibilities in the treatment of intersex and for intersex advocacy. 1. The Role of Genes and Hormones in SexuaI Differentiation; S.F. Kemp. 2. Towards a More Inclusive Conception of Gender-Diversity for lntersex Advocacy and Ethics; D.T. Ozar. 3. Intersex and Human Rights; A.D. Dreger. 4. International Legal Developments Protecting the Autonomy Rights of SexuaI Minorities: Who Should Determine the Appropriate Treatment of an Intersex Infant? ; J.A. Greenberg. 5. Advances in Treating (Or Not Treating) Intersexed Persons: Understanding Resistances to Change; E.G. Howe. 6. Experiments in Gender; T. Murphy. 7. PrenataI Gender lmprinting and Medical Decision-Making ; W.G. Reiner. 8. PsychosexuaI Differentiation in Common Intersex Conditions; K.J. Zucker. 9. Ethics and Gender: The Right to be Wrong; Diamond, H.G. Beh. 10. ClinicaI Management of Children and Adolescents with Intersex Conditions; F. Pfafflin, P. Cohen-Kettenis. 11. Educating Intersexed Persons and their Parents; P. Carmichael. 12. Intersex, East and West; G.L. Warne, V. Bhatia. 13. Adutt Outcomes of Feminizing Surgery; S. Creighton. 14. Vaginal Reconstruction and the Role of the Psychologist; L-M. Liao. 15. Intersex and the Rhetorics of Healing; D. Hester. 16. The Ethics of Using Dexamethasone to Prevent Virilization of Female Fetuses; S.E. Sytsma. 17. Intersexuality, Medical Practice, and Cultural Relativism; S.E. Sytsma. 18. Authenticity and Intersexuality: A PhilosophicaI Analysis; H.E. Stark. 19. Christianity and Human Sexual Polymorphism: Are They Compatible? ; P.B. Jung. 20. Ethics and Futuristic Scientific Development Concerning Genitoplasty; J.M. Schober. 21. Postmodern Intersex: I. Morland.